Welcome to Introduction To Guitar For Ensemble! The purpose of my book is to give teachers a resource that will help them educate guitarists in the areas of Rhythm, Sight-Reading, Chords and Soloing. This book and my lesson plans move at a slow and gradual pace, so that every student is given enough time and repetition to insure success in an ensemble class setting. 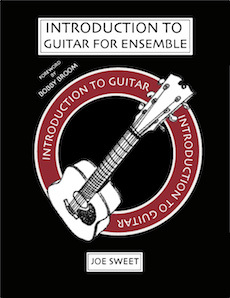 The book is intended to be especially helpful for instructors who are not principally guitarists. This book should be particularly helpful to many Band, Orchestra and Choir teachers, who have been asked by their schools to teach guitar ensembles. This website was built to provide teachers with a supporting resource; which includes one year of lesson plans, worksheets and handouts as well as tests and quizzes. In addition, the website provides recommended pop songs, plus links to helpful and instructional YouTube videos. I hope the resources presented in my guitar book, in addition to the resources offered on this website, will help to make your teaching experience more enjoyable.